Genesis Metals: Advancing Its Chevrier Gold Project To An Economic Gold Resource In Quebec | Energy and Gold Ltd.
1. Geological 3D modeling of the Main Zone to enable an understanding of controls on mineralization; this will allow more efficient targeting for further evaluation by drilling in Q2 of 2017. 2. Evaluation of six new priority targets arising from the compilation of all data for the entire Chevrier property. 3. Geophysical surveys are underway to better define potential drill targets within priority areas. 5. Dependent upon the results of geophysical surveys, geological mapping and sampling of the new target areas, a commitment to drill test ranked targets. Another attractive aspect of Chevrier is that the Main Zone is only 2-3% of the entire property package which means there is substantial potential for exploration of other high priority targets throughout the rest of the property. Genesis is committed to delineating an economic deposit at Chevrier which means that it will be important to expand the size of the deposit. The net result of the 2016 trenching program and 6 new identified targets at Chevrier is that there are additional structures on this property that will need to be tested in the new year. This gives Genesis potential for new discoveries at Chevrier. Additionally Genesis will be looking to upgrade both the Main Zone as well as the South Zone deposits. 2017 is set to be an exciting year for Genesis during which it has the potential to make some big steps towards moving Chevrier up to an economic gold resource. The South Zone at Chevrier also holds significant potential; Met-Chem estimated that the deposit had a potential for between 8.5 and 9.0 million tonnes at 1.8 to 2.2 g/t gold,however, they stated that the zone didn’t come up to 43-101 standards due to a lack of density of information. “In Met-Chem’s opinion, the Chevrier model is adequate for the present estimate of a potential tonnage and grade of mineralized material in the South Chevrier deposit. The Chevrier South deposit has been investigated by only 19 drill holes. Met-Chem recommended consistent re-logging and re-assaying of all drill core plus assaying of core that was not sampled. 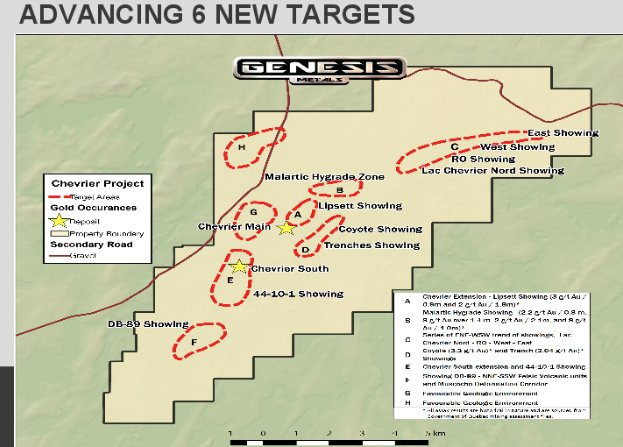 During the first half of 2017 Genesis is planning a substantial Phase 1 drill program (5,000-10,000 meters). 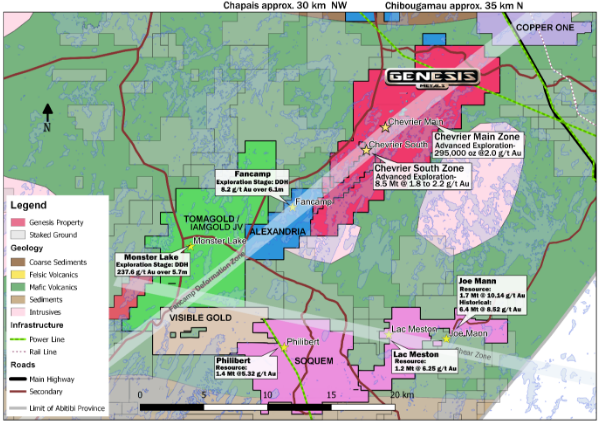 Genesis is also committed to putting together a complete geological model of the Chevrier Main Zone, as well as the east zone and the south zone in order to better understand the controls on the mineralization. The main objective is to be able to present a package to a larger company (potential partner) which illustrates an easy path to production. With a solid resource foundation already in place (~300,000 ounces at ~2 grams per tonne in the Main Zone) Genesis is in an exciting position to potentially increase the size (and potentially the grade) of the Chevrier Deposit during 2017. This potential is what makes Genesis an attractive speculation for investors, a rising gold price and improving sentiment on the junior gold mining sector are simply icing on the cake. The article is for informational purposes only and is neither a solicitation for the purchase of securities nor an offer of securities. Readers of the article are expressly cautioned to seek the advice of a registered investment advisor and other professional advisors, as applicable, regarding the appropriateness of investing in any securities or any investment strategies, including those discussed above. Genesis Metals (TSX-V:GIS) is a high-risk venture stock and not suitable for most investors. Consult Genesis Metal’s SEDAR profile for important risk disclosures. EnergyandGold has been paid to cover Genesis Metals and so some information may be biased. EnergyandGold.com, EnergyandGold Publishing LTD, its writers and principals are not registered investment advisors and advice you to do your own due diligence with a licensed investment advisor prior to making any investment decisions.